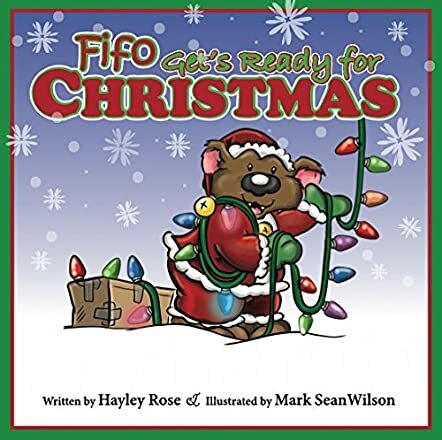 Fifo Gets Ready For Christmas by Hayley Rose is a funny and entertaining Christmas story. The reader will take a journey with Fifo as he meets with various individuals in helping him prepare for Christmas. Whether it’s baking, decorating, sending out Christmas cards or one of many other things that Fifo is involved in, the reader will enjoy his many different friends that help him. Fifo enjoys being able to share in this festive season with so many of his friends as he accomplishes the tasks before him. The most interesting part is at the end of the story where author Haley Rose writes: “Fifo spends time with loved ones. What’s your favorite part about Christmas?” This enables the reader to ask the child they may be sharing the book with to open up and tell them what they enjoy the most. This can easily be a fun interactive book that will involve both the reader and those youngsters being read to. Illustrator Mark Sean Wilson creates wonderful works of art, allowing the reader to feel a part of the story with the colorful images. This is a lovely seasonal book that reaches out to many different types of readers who are interested in exploring Christmas and the various ways that a person could get ready to enjoy it. Hayley Rose allows the flow and purpose of the story to conclude in a very significant way to enable deeper communication between the reader and those being read to. This is a very enjoyable book!